Visitors from all over the world come to our park stores in search of information, insight and inspiration. At our park stores, you will find the very best information on the parks we serve in Hawai‘i and American Samoa. Discover the treasures that can deepen your connection to the parks. Our park store staff or cultural demonstrator may be the first contact visitors have in our partner national parks. We strive to ensure they have what they need to make their visit safe and memorable. HPPA and NPS staff work together to create fun ʻIke Hana Noʻeau cultural demonstrations held on the front lanai (patio) at our partner Hawaiʻi Volcanoes National Park. Volunteers In Parks (VIP) is an NPS program that matches volunteers from around the world with national parks to fill positions in all areas where there is a need. Our partner parks’ VIP programs receive donations from HPPA in order help meet operating expenses, including volunteer stipends. We have contributed to several visitor center projects over the years, including planning, renovations, and exhibits. Currently, Visit Kīlauea Visitor Center in Hawaiʻi Volcanoes National Park to enjoy a series of intricate paintings by artist John Dawson, depicting the biodiversity of the volcanic landscape from summit to sea. At Puʻukoholā Heiau National Historic Site, enjoy striking, dramatic metal panels that tell some of Hawai‘i’s oldest and most powerful stories. 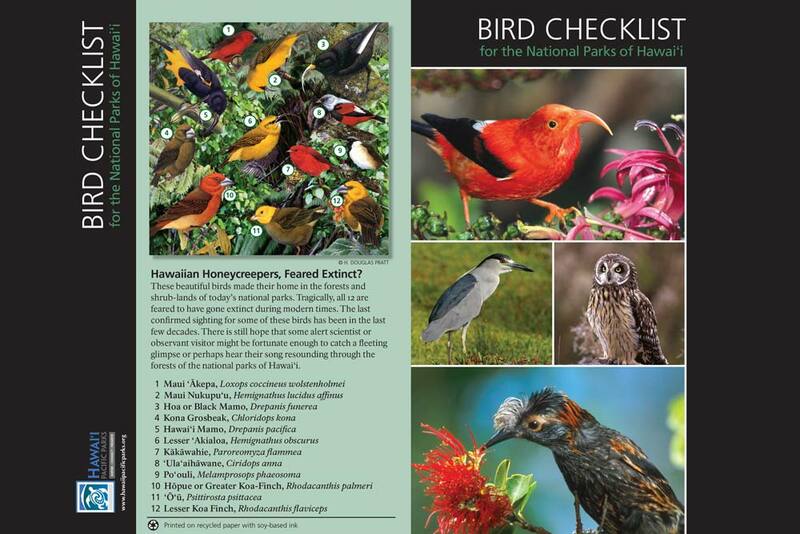 We support the printing of free publications for our partner parks, from birding checklists to informational handouts translated into multiple languages, to trail guides and maps.